Normal? Who's normal? Not you, that's for sure! No one you've ever met, either. None of us are normal according to God's definition, and the closer we get to each other, the plainer that becomes. Yet for all our quirks, sins, and jagged edges, we need each other. Community is more than just a word---it is one of our most fundamental requirements. So how do flawed, abnormal people such as ourselves master the forces that can drive us apart and come together in the life-changing relationships God designed us for? In Everybody's Normal Till You Get to Know Them, teacher and best-selling author John Ortberg zooms in on the things that make community tick. You'll get a thought-provoking look at God's heart, at others, and at yourself. Even better, you'll gain wisdom and tools for drawing closer to others in powerful, impactful ways. With humor, insight, and a gift for storytelling, Ortberg shows how community pays tremendous dividends in happiness, health, support, and growth. It's where all of us weird, unwieldy people encounter God's love in tangible ways and discover the transforming power of being loved, accepted, and valued just the way we are. In Everybody's Normal Till You Get to Know Them, Ortberg once again reveals his gift for sharing profound insights using a lighten-up approach. With winsome humor and a fondness for well-spun stories, he pops the myth of normalcy and hands us the keys to creating and sustaining relationships. Because in all the rewards and struggles of community, we're investing in something beyond our comprehension. You could call it heaven. You could call it home. It's the place where all of us are headed, all of us belong, and all of us will be normal at last. 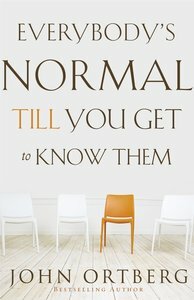 About "Everybody's Normal Till You Get to Know Them"